with countless young boys and girls—now young men and wo­men, who were his associates and loved him, and in turn were loved. This story about Ike is writ­ten by his father—by me, if you pardon the personal. And to you friends from away who are interested, you might turn to my Glimpses (Page 13) for further reference to him. 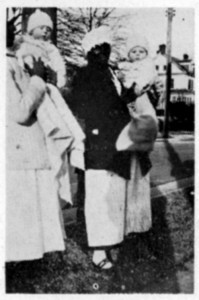 "Aunt" Pat and baby Isaac and Ada McLaurin and baby LeGrand Everett 3rd, same ages. (LeGrand 12 days older than Isaac). For after all, this closes his chapter, the last page in the book, the finis. And I drop a tear, but with it a smile, to a boy I loved, and who loved me, who was ever considerate, thoughtful and devoted — and who never in all his 20 years gave me one moment’s concern or trouble. And again I ask you readers to bear with me in this rather unusual editorial or re­portorial freedom; but then you know me, and you knew young Ike. Now so much for that. Perhaps a brief review of his life may interest you. Sketch of Isaac London Jr.
Isaac Spencer London Jr., was born in Rockingham Aug. 5, 1926, son of Isaac S. London and the late Lena Everett Lon­don. She was born Aug. 10, 1891, and died Jan. 9, 1930, and is buried in the little Everett cemetery on LeGrand street, beside her parents, Secretary of State W. N. and Lena Payne Everett. (Lena was moved Jan. 29, 1947, from the Everett little cemetery to Eastside cemetery to be beside Isaac; 17 years apart but now re-united). Ike attended the Rockingham schools. He automatically be­came a member of the Episcopal church. On Feb. 27, 1944, he stood the physical examination at Char­lotte for the Air Corps Enlist­ed Reserves, and Major James Wheless gave him the oath March 8th. This was before he was 18 years old. On Feb. 9th, 1945, at the age of 18 1/2 he was ordered to report to Ft. Bragg for active duty, and he and his life-long young friend, Fred Patterson, went there together, and remained together for sev­eral months — Fred is one day older than Ike. The two boys were shipped out of Ft. Bragg Feb. 16, 1945, to Keesler Field. In late June he and Fred were transferred from Keesler Field to the air base at Harvard, Nebraska, but allowed to come by Rockingham — a delayed-in­transit leave. He reached home June 24th. For several days before leaving Keesler, he com­plained of a hurting in his side.